This is the new book from Tom and Keith Waterbrook-Clyde. 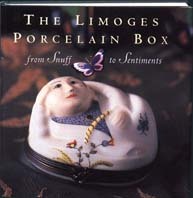 Almost half of the book is devoted to Limoges boxes, featuring the boxes from Chamart, Artoria, Dubarry, and others. There are hundreds of gorgeous full-color pictures of Limoges boxes in exquisite detail. An expanded section on maker's marks and fake Limoges marks is included. And GroundStrike Collectibles is mentioned inside (on p. 244)! A much-anticipated book that continues the tradition of excellence begun with their earlier work, The Decorative Art of Limoges. Click here to order from Amazon.com! Only $39.95! 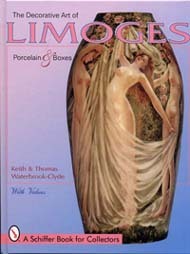 From Tom and Keith Waterbrook-Clyde, this is a great book on Limoges porcelain and Limoges boxes with over 200 pages and 1100 photographs. There is an invaluable section that covers the different marks found on authentic Limoges porcelain. This is a hardcover clothbound museum-quality book with 240 pages of information on Limoges boxes and over 300 photos and illustrations. 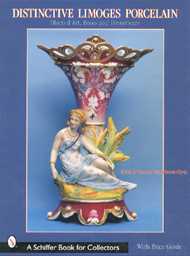 It covers the history of porcelain from the very beginnings in China to the development of Limoges boxes in France to the resurgence of popularity in current day. There is a wonderful chapter showing the "birth" of a box, with detailed pictures and a description of the complete process. Click here to order from Amazon.com! Price varies since this book is out of print.